The benefits of boredom for children and why you should let your child be bored. Why being bored is good for your child. Our children are growing up in a fast-paced environment. With all of the modern conveniences we have before us, we rarely have to wait for anything. We don’t even need to wait for commercials before continuing on with our show. If we want to talk to someone, we can pretty consistently get a hold of them via text, cell phone, or social media pretty instantly. If we want to know the answer to a question, Google is right in our pockets. We have endless opportunities for communication and stimulation. Because of this, our children rarely have a chance to get bored. We also live in a world where we can compare ourselves to thousands of people very similar to ourselves (and millions of those dissimilar). While we used to only be worried about keeping up with that Jones family, we now have families all over the world we can try to keep up with. So we mothers look around on our favorite social media sites (it doesn’t matter which one) and see what at least hundreds of other mothers are doing with their children. We don’t look at ONE mother, we look at hundreds. Then we try to keep up with as much of what they are doing as a whole as we can. We try to take the best highlights from so many people that we completely overbook our lives with fun ideas. Then someone writes an article about how you only have 18 summers with each child, and 18 is a very small number. We then feel a level of panic that yes, we really do need to pack these amazing things in because 18 isn’t very many and time is running out! Today I want to tell you why you should let your child get bored. 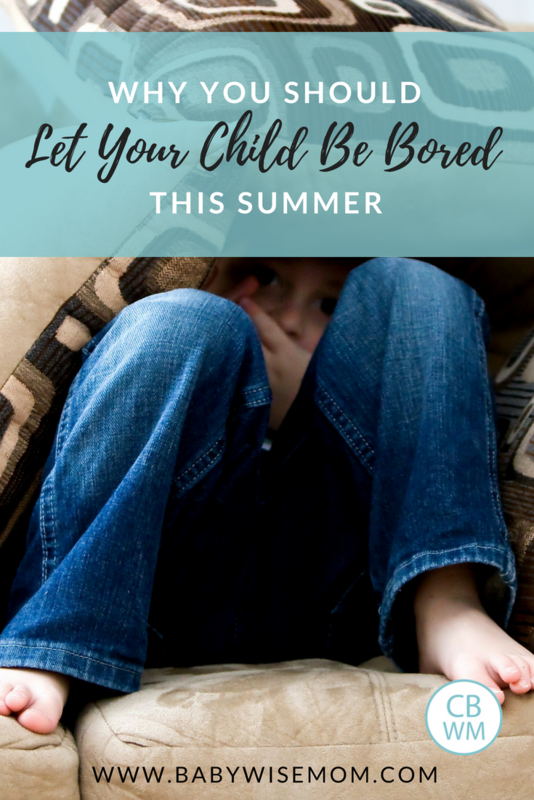 Let your child get bored this summer, next weekend, and any other day of the year. It is not only okay to let your child get bored, it is good. When you have nothing scheduled to do, and you are faced with either doing nothing or creating something to do, you are going to create it. 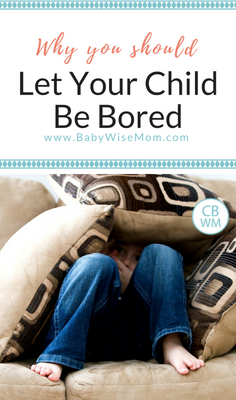 Your child will not choose to sit and be bored for long. She might try. She might stage a sit-in, proclaiming her feelings of boredom as she tries to wear you down so you will solve the problem for her or at least default to electronics. If you hold your ground, and make it clear that you don’t mind if she is bored, she will find something to do. Studies have found boredom leads to more imagination and problem solving. We do a technology fast for one week of every month, and during that week, my children are the most self-driven. They try new things. They play with each other more. They make up games. They draw. They read. They end up having a really great week! When you are bored, you are motivated to try and solve problems. Humans are great at solving problems if they will give it a try! Boredom gives time for people to need to solve problems. Along that same thought, when my children are bored, they will turn to each other to come up with something to do. Even 12 year old Brayden will find something mutually enjoyable to do with 5 year old Brinley when it is just the two of them and they are bored. A big part of that is Brayden wanting to make Brinley happy; the interaction strengthens their relationship and bond. I mean, I love that boredom forces us to face things. Burying thoughts, feelings, and emotions is not healthy, and if boredom helps us have to face those things, I call that a win for mental health. It is also a great way to get to know yourself. If you are forced to find something you like without another person directing your efforts, you will be more apt to find something you enjoy and get to know yourself better. When you have nothing to do and want to find something, you will be more willing to give things a try. This might lead to you finding a new talent or new joy in life. Think about it. If your child never has a moment to figure out what to do with himself, how does he learn how to function alone or independently? If your child gets bored, he has time to learn how to function on his own. When your child tells you he is bored this summer, don’t let yourself feel guilty. Don’t run through the hundreds of things you could be doing but aren’t doing. Instead think, “Good. I am glad I gave you that opportunity.” Your child will develop his imagination, his creativity, hobbies, and perseverance through working through boredom. So as you plan out your schedule for this summer, leave time for boredom. 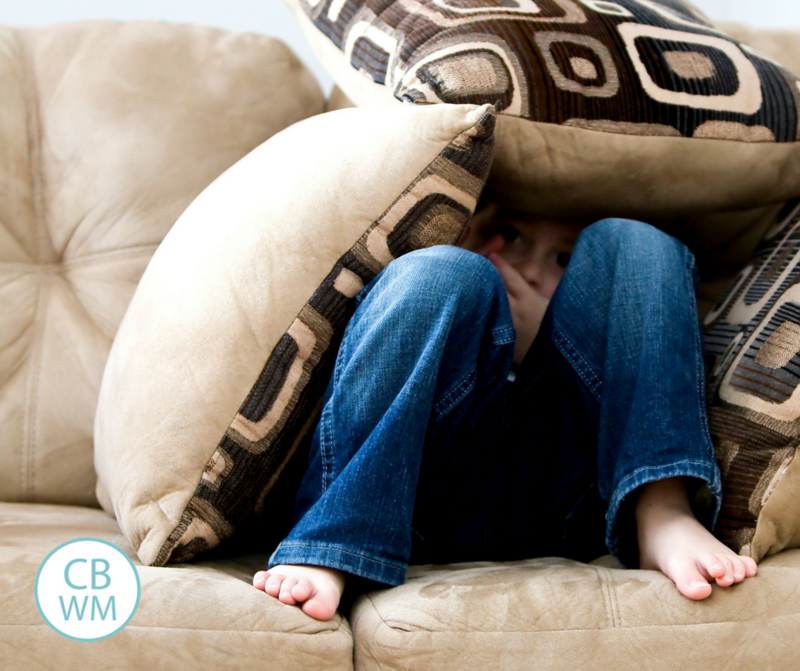 Don’t be afraid to keep openings in your schedules and let your children really know what bored feels like and let them work through that. Dare to let your child get bored.